John Stewart is the Chair of The UK Noise Association and author of “Why Noise Matters” (ISBN: 9781849712576 – Taylor & Francis/Earthscan, 2011). He also edited and contributed to “Poor Show” (Simon Wolff Charitable Foundation, 1988) which addressed poverty, transport and health in South London and contained interviews with people affected by traffic pollution, as well as useful facts and figures. It is a road which is very special for me. It is not a tree-lined boulevard or a pretty country lane. In fact, it is one of the noisiest, dirtiest roads in the country. But, that’s why it is so special. Thirty years ago when I was newish to London I took a wrong turning and found myself walking along the Blackwall Tunnel Northern Approach Road. (Sorry for the non-catchy name but it does what it says on the tin). I was hit by a wall of fast-moving traffic all the way from the Blackwall Tunnel to the Bow flyover, a distance of approaching two miles. And as I looked at the tower blocks, flats and estates within yards of the road and saw the children playing beside the roaring traffic, I thought: “never again should this kind of road be built”. Nothing, but nothing, can justify this acoustic hell. That experience was one of the reasons I became so deeply involved in the “anti-roads” movement in the late 1980s. I chaired ALARM, the London-wide umbrella network made up of 250 local groups opposed to road building across the capital. And in the 1990s I was one of the founders and the chair of the national network, ALARM UK. You can read about it in Roadblock. (The original had wonderful pictures but it was before the age of the internet and was never put online). Unbelievably, one of the road schemes proposed was a parallel Blackwall Tunnel. It would have poured yet more traffic within yards of the tower blocks, flats and estates. I worked alongside the local protest group, SPLASH, brought together by the radical nun, Sister Christine. Anybody who dares to suggest that people choose to live beside a road like the Blackwall Tunnel Northern Approach or that they get used to the noise should have been at one of those meetings. The passion, the anger, the helplessness was palpable. However, SPLASH was successful. The plans for a parallel tunnel were stopped. In fact, virtually all the road building proposals for London of the 1980s and 1990s were abandoned in the face of overwhelming public opposition. The fiercely contested M11 Link Road in East London, completed in the mid-1990s and the focus of the longest, continuous direct action protest in British road-building history was the last major road to be built in the capital. Until now. The Mayor of London has consulted on plans to build…..a parallel Blackwall Tunnel. He’s renamed it. He is calling it the Silvertown Tunnel. And it has a slightly different alignment to the previous proposal. But it will still bring a flood of extra traffic on to the Blackwall Tunnel Northern Approach Road since it will double the capacity of the existing tunnel, 6-12 million extra vehicles a year. And so last week I retraced my steps. Once more I walked from the Blackwall Tunnel to the Bow Flyover. The tower blocks have had a lick of paint. Some of the flats have had been modernised. Some, indeed, were new. There seemed to be a few more noise barriers than previously. But the roar of the traffic was still there. I had taken a noise meter with me. 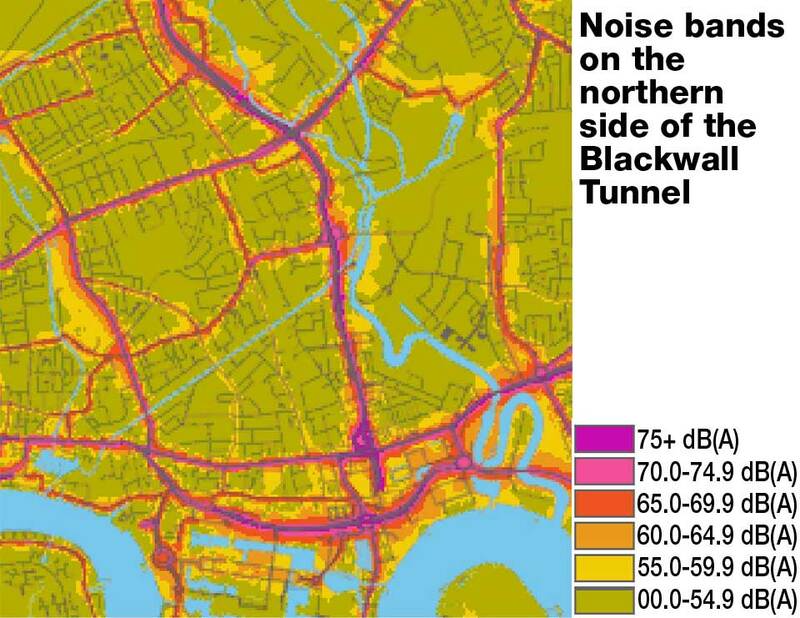 The official statics shows that it averages out at over 75 decibels (see map – the Blackwall Approach Rd runs north/south straight through the middle of the map) – much higher than the aircraft noise experienced by most people in West London. When I was there the noise never fell below 60 decibels and frequently exceeded 85 decibels. The area, too, has one of the highest levels of air pollution in the country. The children were still playing within yards of the road. A mother and her young son, laden with their shopping, trudged along it to catch the bus. The youths had a quick fag outside the chip shop before disappearing down the gray, featureless underpass. I then heard another noise – aircraft. Thirty years ago, London City Airport hadn’t opened. Today Blackwall and Bow are directly under the airport’s take-off flight path. Thirty years ago, the number of planes using Heathrow was half what it is now. They didn’t impact of East London. Today, they are a constant feature. Why don’t they complete the job, I thought, and make Bromley-by-Bow underground station, the terminal for HS2. But back to the Mayor’s plans for a new tunnel. It is simply not required. Transport for London (TfL) argues that the current tunnel is full. 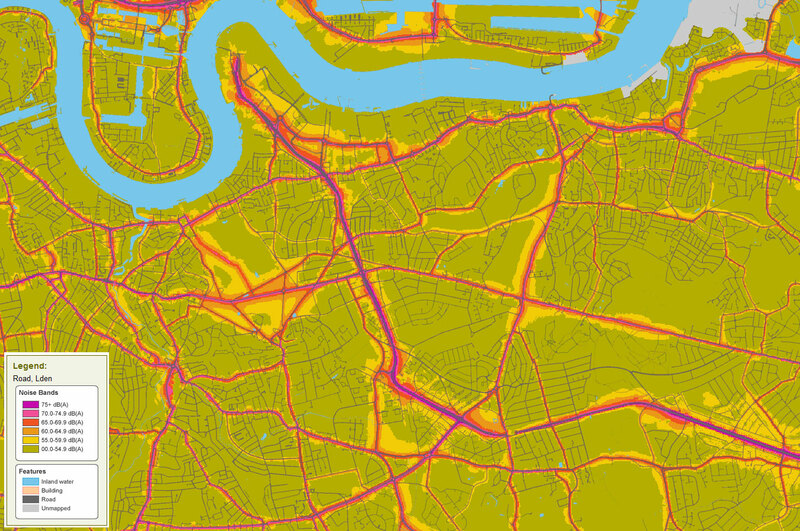 It further argues that, if London’s population rises to 10 million by 2030, gridlock could set in. This is set out in its recently published Roads Task Force report. 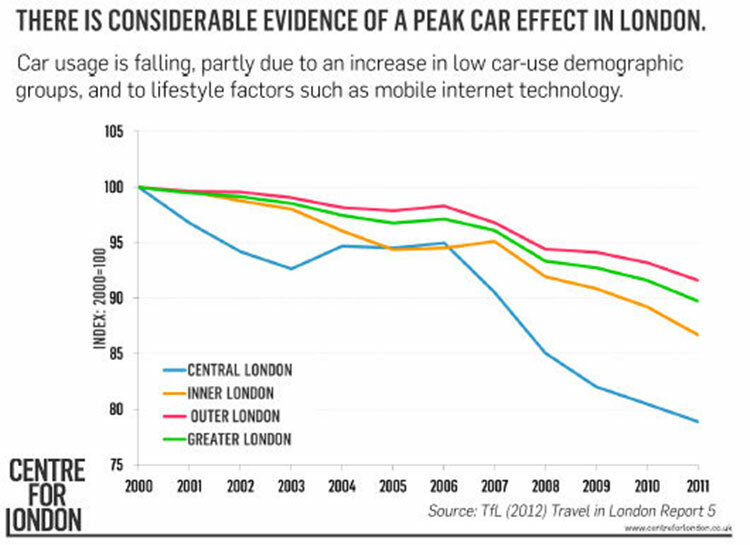 If current policies remain in place, TfL’s predictions are likely to come true. Traffic congestion will become widespread. Clogged streets are already costing business a fortune. According to Traffic Congestion European cities (2011), a study carried out by the navigation system specialist firm, TomTom, London is the third most congested city in Europe. There are effective ways, however, to cut congestion without resorting to building more tunnels and roads. The business organisation, London First, favours road pricing. Indeed, TfL’s Roads Task Force implies that many of its road schemes would be unnecessary if road pricing was introduced. It is the logical answer but politicians are wary about the reaction of the public. Tougher parking standards, a further reallocation of road space to non-car modes, policies to revive town centres at the expense of edge-of-town developments would all help reduce traffic. And that is the key: traffic reduction. Tough targets to reduce car traffic would provide the incentive for TfL and the boroughs to adopt these sorts of policies. And, remember, a 2010 Department for Transport report found that 66 per cent of trips made in the UK were less than five miles, yet more than half of these were made by car. Twenty two per cent of trips were less than one mile, around a 20 minute walk, but 20 per cent of these journeys were also made by car. Road pricing, introduced in the right way, can be popular. The money collected from the Central London scheme introduced by the previous Mayor, Ken Livingstone, made possible the historic improvement to London’s bus services. Just think how business would feel if their vehicles were no longer bogged down in traffic. And how Londoners would react if they were told that road pricing would mean the exorbitant fares they pay on the bus, tubes and trains were to be halved. I don’t know if the fares could be cut as much as 50% but you get the drift on how to sell road pricing. 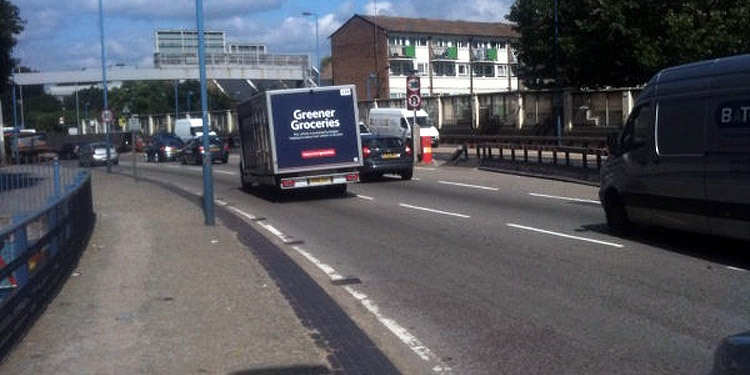 And, oh yes, it would be welcomed by the people living beside the Blackwall Tunnel Northern Approach Road. Noise justice. This entry was posted in Guest Post, News and tagged approach roads, Blackwall Tunnel, Bow, greenwich, John Stewart, noise, silvertown tunnel on October 20, 2013 by Stewart Christie.